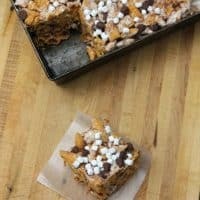 For your next camping trip or bonfire bring along these mess free S’mores bars for a yummy treat that will satisfy the kids and still keep their hands fairly clean!! 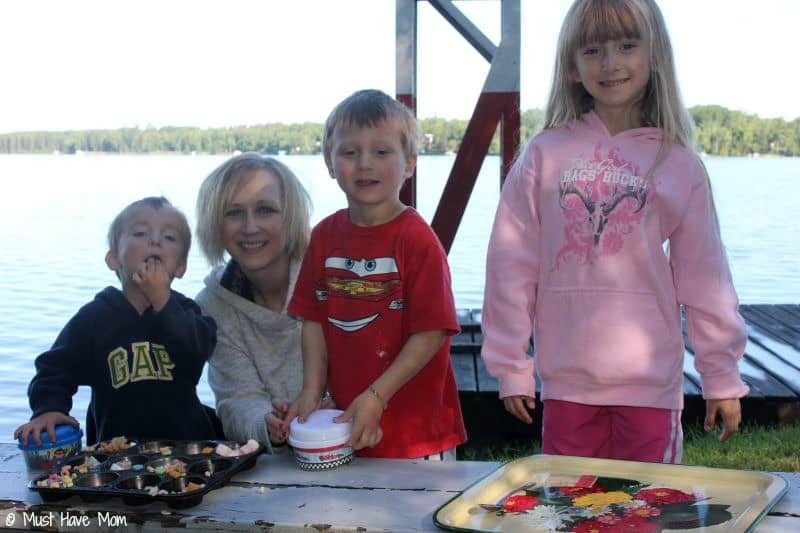 I just got back from a week long vacation at our family cabin on the lake. 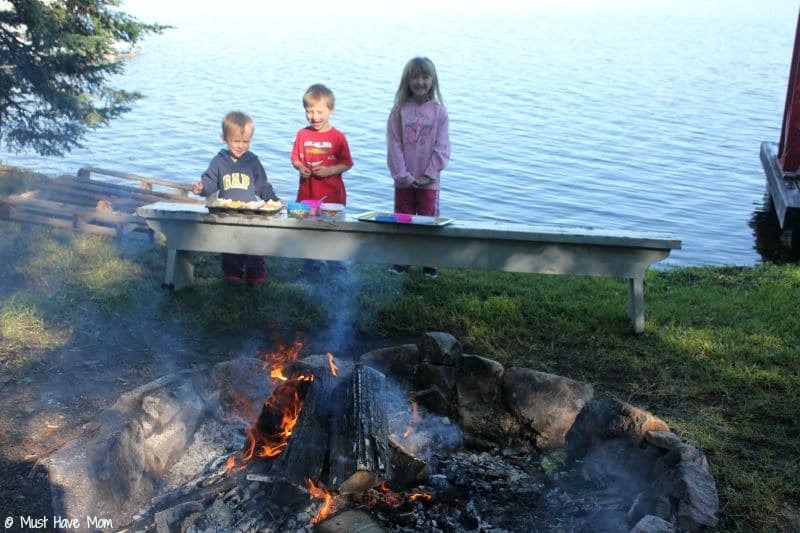 One of our favorite things about having a family sleepover at the cabin is the opportunity to have a bonfire! We love to sit around the fire and enjoy one another’s company. 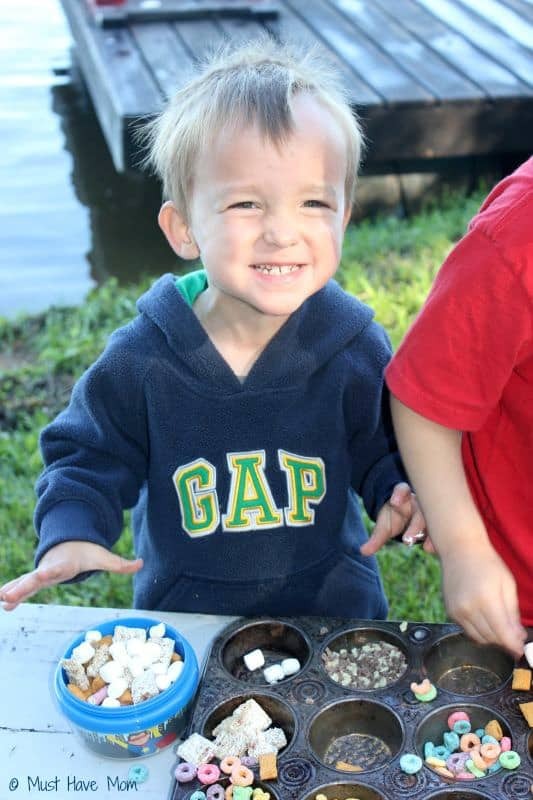 We always make S’mores and inevitably my kids end up looking like this! Covered in sticky marshmallows and chocolate. This week I decided to try out some new mess-free snack ideas that we could enjoy around the bonfire. Knowing they involved Kellogg’s cereal, my kids were game to try them out! Before taking off for the cabin I stopped at Walmart and picked up some Kellogg’s cereal. I got Krave (the chocolate filled kind),Froot Loops, Corn Pops, Rice Krispies Treats, and Mini Wheats. Kellogg’s must know that we always snack on cereal at night because they came out with special edition boxes highlighting the late night snack idea. My kids eat cereal as a bedtime snack all the time. This is so up their alley. To replace our messy S’mores at the bonfire I decided I would concoct a mess-free S’mores bars recipe. Boy did it turn out good AND it tastes just like S’mores without all the sticky mess. Not only that but it also eliminated the need for me to sit and roast a marshmallow for each kid and assemble their S’mores. I made these before the bonfire and served them up on little squares of wax paper. They were the perfect mess-free replacement for S’mores! The kids thought they were the best and they didn’t even miss the messy S’mores. Of course I also had some other fun snacks up my sleeve. Since we typically do a fire and then send the kids to bed I knew they would need a late night snack to tide them over until morning otherwise they would keep coming out of their rooms complaining of rumbling tummies. I created this fun cereal snack bar that they could indulge in around the bonfire. 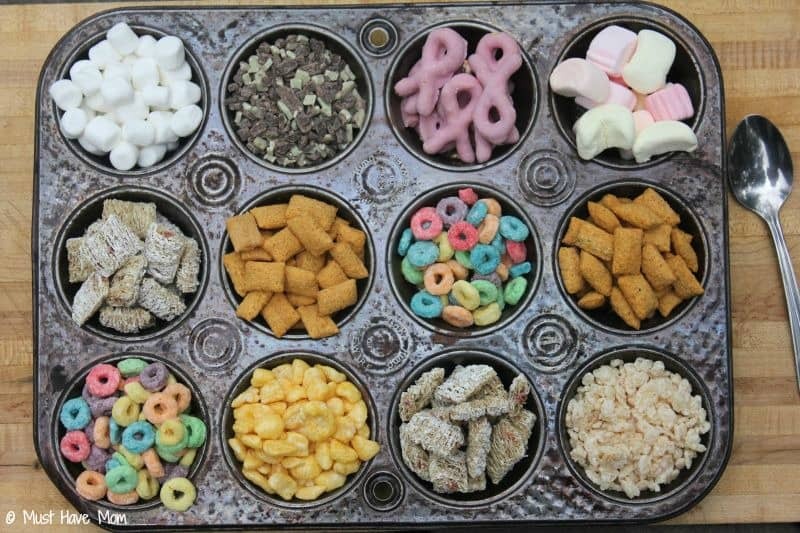 I just used a muffin tin and filled each circle with different cereals and snacks. I included Kellogg’s Mini Wheats, Krave, Froot Loops, Corn Pops, Rice Krispie Treats, mini marshmallows, mint chocolate pieces, yogurt covered pretzels and flavored marshmallows. The kids started digging in before I completed setting up my bonfire snack bar. They couldn’t wait to dig in to the cereal snack bar tray. 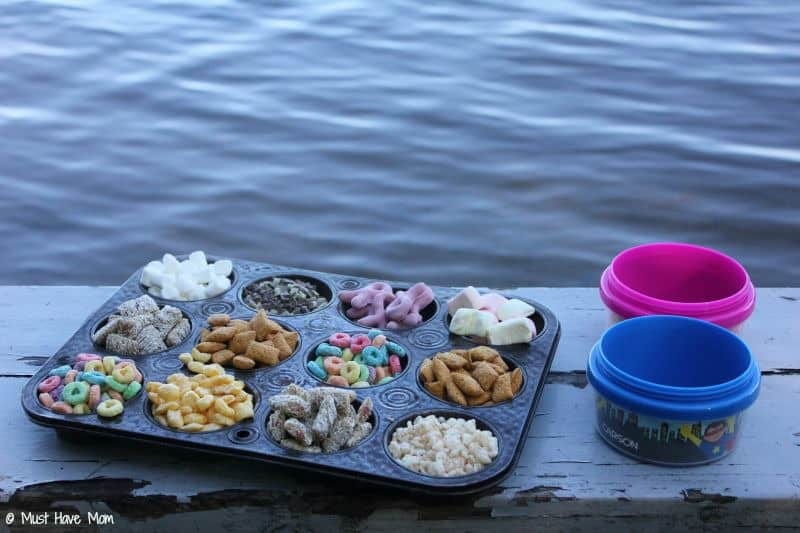 They each had their own bowl and could make their own cereal snack mix. I couldn’t peel the boys away from the cereal snack bar tray. They loved it and kept coming back for more. I loved that their tummies were getting a late night snack so they could go to bed and sleep good! After a busy day of swimming, water gun fights, fishing off the dock and boat rides, this was a great way to wind down and enjoy the fire. I actually got to sit down and enjoy the fire too! I wasn’t busily making s’more after s’more for the kids. Instead I was sitting back watching THEM make their snack! Hooray for independence! They loved being able to do it themselves too. 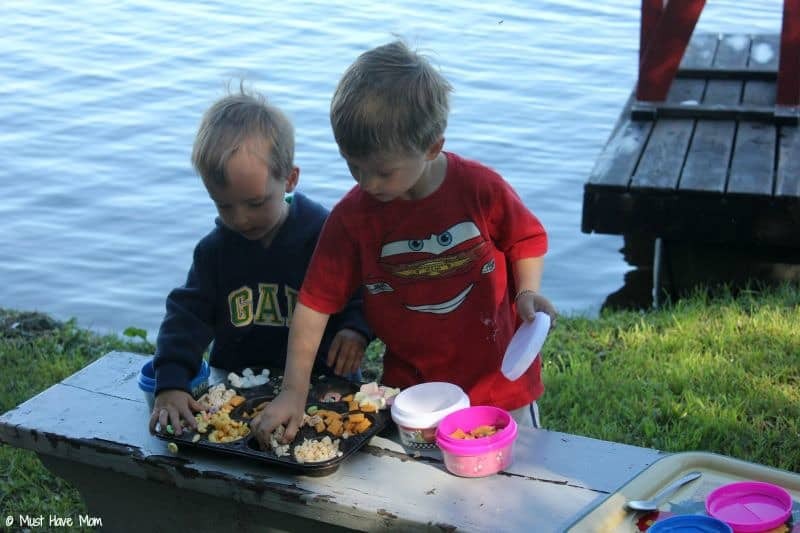 The mess-free snack ideas were a huge hit both with the kids and with mama! I got to relax for once and they got a much better bedtime snack! Here is my final mess-free snack idea! Be sure to watch my tip on what to do with the leftover cereal! You can pin my mess-free S’mores Recipe for later or print it off! 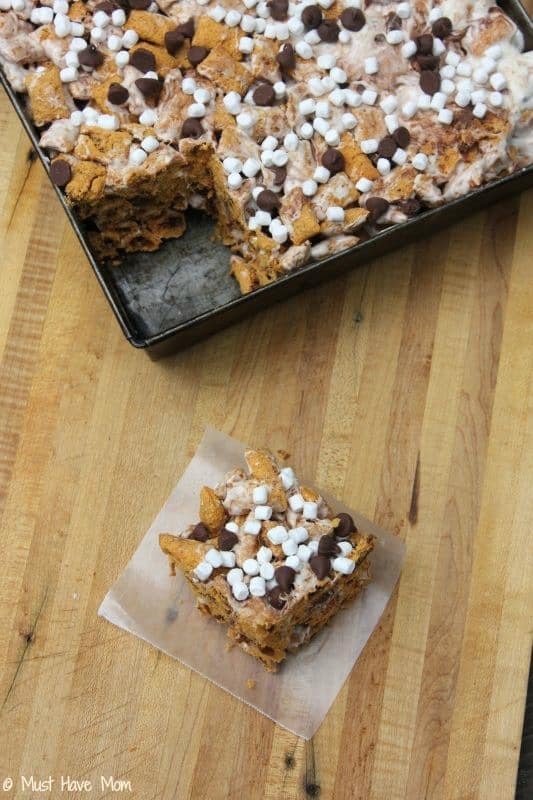 Mess-free S'mores bar made with Krave cereal. Melt 3 Tbsp butter in large, microwave safe bowl. Stir in 5 1/2 cups mini marshmallows and heat for 30 seconds. Remove from microwave and stir well. If not completely melted microwave 20 seconds longer. Stir in Krave cereal and mix well. Press into greased 8" x 8" pan. Sprinkle chocolate chips and tiny marshmallows on top. Allow to cool and then cut into bars. What are your favorite late night bonfire snacks? 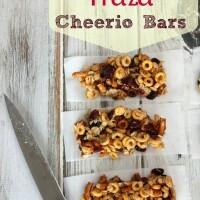 Cranberry Pretzel Cheerio Bars Recipe: Healthy Homemade Snacks! 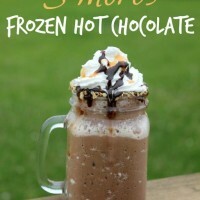 Rolo S’mores Frozen Hot Chocolate Recipe: Perfect For Around The Bonfire! 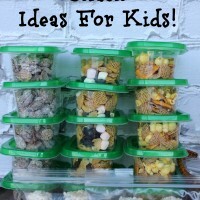 Easy On The Go Snacks For Kids! I absolutely love your recipe and totally want to try it! ASAP! Yum! I’d get excited as the kids are, and they are precious by the way. I am definitely making my own tonight. Thanks for the inspiration and sharing. I am loving how you gave so much variety using the muffin tin. The sticky face and hands really say it all. So much fun! 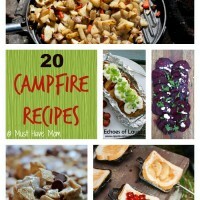 Oh, this recipe looks delish, i love everything about s’mores! Oh I just love that snack! That is so cool! And I bet it tastes quite delicious too! My kids would love it! And I know I love KRAVE; so I’d probably love it too! What a fun snack… and MUCH less messy than a traditional s’more! Putting this on our next family night snack list. Now THIS is the way to eat a smore without the mess! Looks delicious! What a neat idea. Looks like everyone had a great time! Mmm, these look soo good! I can tell the children really enjoyed. This recipe looks so tasty. The mess free S’mores bar is great! I love S’mores, but I don’t like the mess. Problem solved. These mess free S’mores are great. 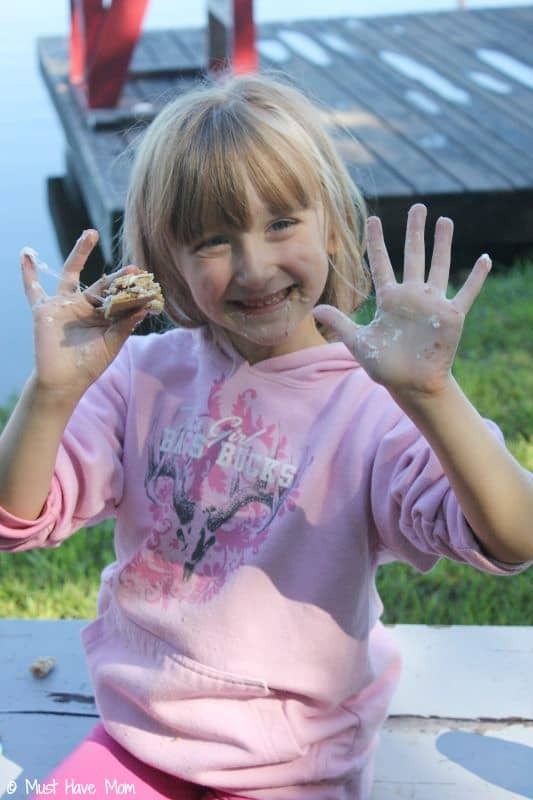 I love S’mores, but the mess can be terrible, especially when kids are involved. This takes sticky fingers out of the equation. Very cool idea! I can always appreciate a cleaner snack idea! The smores bar looks amazing, what a brilliant idea to use cereal! Pinned this – what a great snack to take to a potluck. I love the s’mores bar idea! We love s’mores, but I hate the mess. 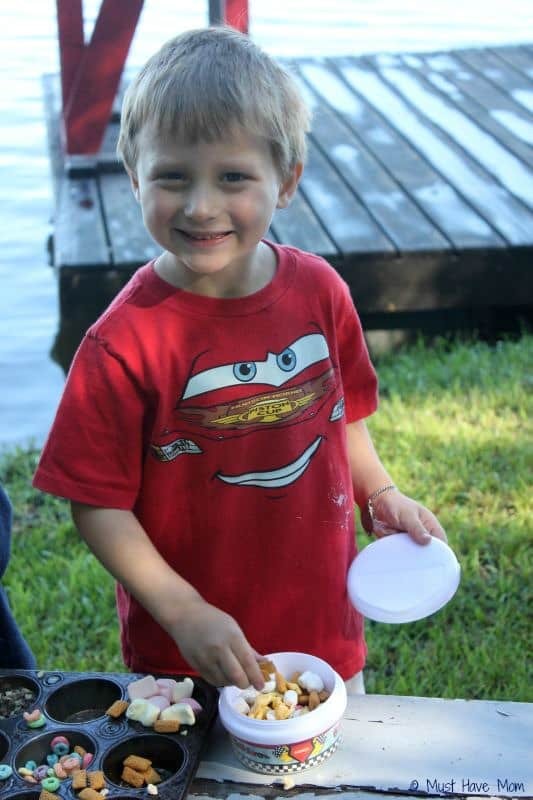 We made s’mores on our camping trip and the kids enjoyed them so much. My kids would LOVE if I made them a whole cake pan of s’mores, great idea. Looks like you all had a really fun time! I am 100% a straight out of the box cereal eater at night!! No mess, no fuss, just yum! I love how you let them decide what to put in their snack mix. You’re such a fun mom! YUM this looks delish!! I am going to have to try this soon. The cereal snack bar is a great idea. I have 3 boys and I still think at their ages of 25,24 and 23 they’d love this. Heck, I ‘d love it. This is such a cute idea. My kids love cereal! Mmmm, your bars recipe looks yummy. Using the muffin tin to hold the snack choices was a great idea! 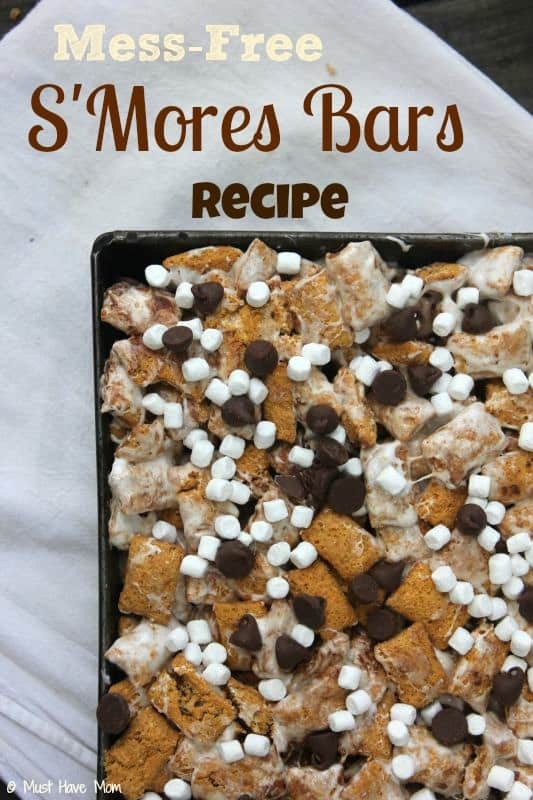 These no mess S’mores bars look so yummy. This is a definite must try. the kids will love them. I bet the kids love these! 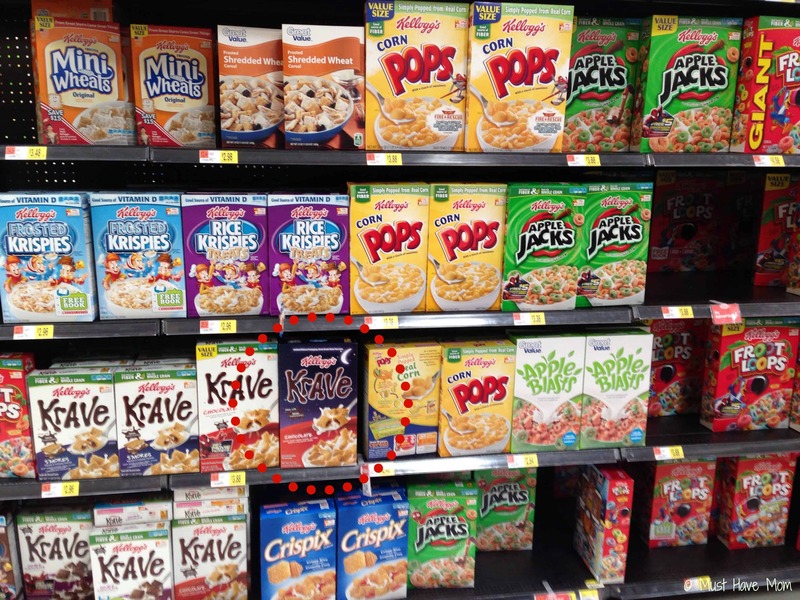 I’m trying to reduce our reliance on cereal – we seem to be so addicted to the simplicity of it! 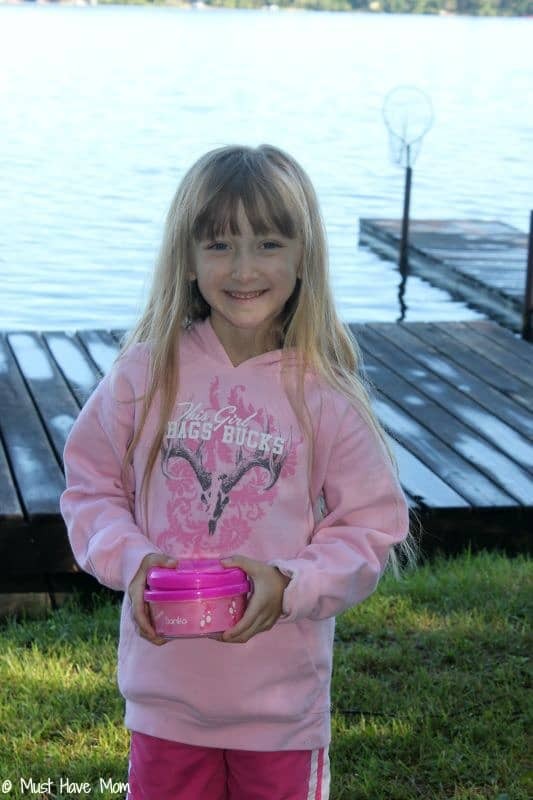 Thanks for stopping by Kathleen!